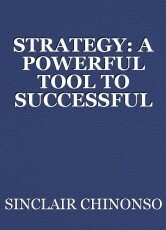 ...A practical narrative on how the application of strategy can help u become a winning investor !! One of the key definitions of investing is that of partaking in a financial asset class or product with the hope/expectation of making some future gains. In monetary terms, investing is putting your money to use with the hope of making more money in future. This means that for an investment to come through, there has to be that ‘hope’ of some future return. But hope is no certainty. So an investment will usually carry some measure of risk. However, the extent of that risk can be influenced/controlled. Therefore successful investing would mean using money to pursue more money while properly managing the risk that come with it. ...put differently, ones investment return(ROI) would to a very large extent depend on how well they can manage any inherent risk that's associated with it. But how can one achieve this? u may ask. To help put out a clear answer, permit me to take u through some logical lane. In investment terms, risk is defined as the probability that actual return will be less than expected return. Logically therefore, risk happens when there’s that likelihood that one’s actual return had been cut down from their expected return. hence Risk on investment will be equivalent to AR < ER. ...where actual return(AR) is the total amount u got post the investment, while expected return(ER) is what u were hoping to get post same investment. ...hence loss on investment will be equivalent to IC < AR < ER. (note how this also relates with risk) This means that the risk on any investment carries the weight of loss therein, and that loss is the disparity between ones initial IC and their AR. Also, gain/return on investment(ROI) will be equivalent to AR > ER > IC. Again this means that for an investment to be successful(bring about some returns), an investor must work towards ensuring that their actual return is no less than their expected return. ...and so by inference, any ROI will always carry some measure of risk for which an investor must have to adjust to. Put differently, for every investment made, an investor will need to ensure that their actual return is just enough to take care of any risk-adjusted return. Mathematically, % investment gain = (AR - IC)/IC while % loss = (IC - AR)/AR. Now since risk is with almost every investment and also carries the weight of loss, it therefore means that losses are a part of an investment circle. ...and so the task before every result driven and success minded investor would be that of striving to always reduce the gap between AR and ER while increasing the gap between AR and IC as much as possible. Hence the key to successful investing is not with avoiding losses, but with reducing it while working towards maintaining a steady increase in gains. Now I know u might be wondering... how then can one acheive this? Just what does it take to succeed and win more as an investor? Well, it's quite simple... by been a STRATEGIC investor. 1) By creating for yourself a clear investing method thats in line with your personality. 2) By always ensuring u plan through with any given investment and then investing that plan !! ...more like having clear answers to the WHY, WHEN and HOW to go about any given investment before undertaking them. Yes that's basically all u need to succeed more. ...for therein lies the key to becoming a winning investor !! Like I always tell folks; If u plan well your vision, u will often times execute your mission. Hector is an Investor who saw value in a certain quoted company V & H Tech Plc and decided to buy some shares of the company. He bought 100,000 units at the time at $2 per share. Risk tolerance (adjusting for any risk) = 50% of expected ROI. ...this means that Hector will only tolerate no more than a 50% drop in his expected ROI. ...he would take any necessary step to safeguard his investment should his expected ROI drop to $20,000 (i.e. 50/100 x $40,000), following from a price rise. Loss tolerance = 10% of IC = $20,000 ...again this means that Hector will take necessarily steps to safeguard his investment should his capital drop to $180,000 (i.e. $200,000 - [10/100 x $200,000]), following from a price downturn. He however plans to adjust his risk/loss tolerance where and when necessary as he grows his investment. With just this small note, Hector knows exactly what to do, when and of course how to go about doing them. ...so any possible volatility or change in trend wouldn’t be of any worry to him as long as he is sticking religiously to his well thought out investment plan. While the stock market can be full of uncertainties, Hector does have a very low chance of suffering any negative impact of an unforeseen loss, and a high chance of making some positive return on his investment. More so, his laid out plan has ensured that he's well equipped to navigate the uncertainties associated with his investment and also better manage his emotions. This way, Hector is very well placed to gain much more than he can ever lose. ...that way, he can often times emerge a winning investor !! At the very least, Hector can be sure of protecting his invested fund. ...with just a small note doing the magic !! However, he couldn’t have achieved this without planning. ...but then again, he also could never have put his plan to good use without having a STRATEGY in place. Because when it comes to investing, those who fail to strategize have the least success rate. So don’t just be an investor... be a STRETAGIC ONE !! May that be your lot !! © Copyright 2019 SINCLAIR CHINONSO. All rights reserved. Must Read! Easy $Money$ Made at Home. Online Success. Warren Buffet is mad: no to taxing the super rich. Are We Really The Sons Of Mountain ? THE REALITY BEHIND NIGERIAS DEBT BURDEN. This page was created in 0.5165 seconds.